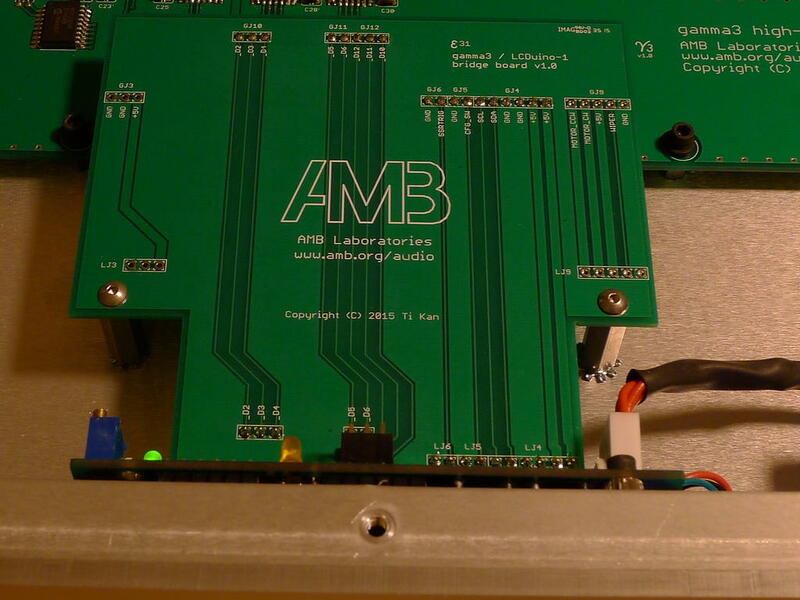 The backplane board is mounted with 1/4" tall standoffs on the chassis bottom, with its input/output side flush against the rear panel, and centered between the left and right sides. 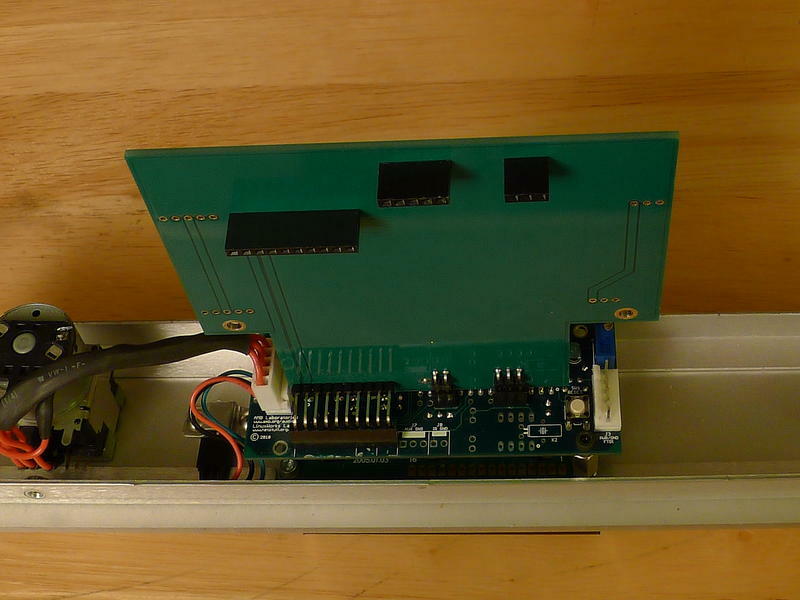 The LCDuino-1 and its display module is mounted centered on the front panel, both vertically and horizontally. The display module is one of the recommended Newhaven LCDs, mounted to the front panel with 3/16" spacers. I am doing this purely for cosmetic reasons, because I thought that the long wire runs from the backplane board to the LCDuino-1 are somewhat unsightly. 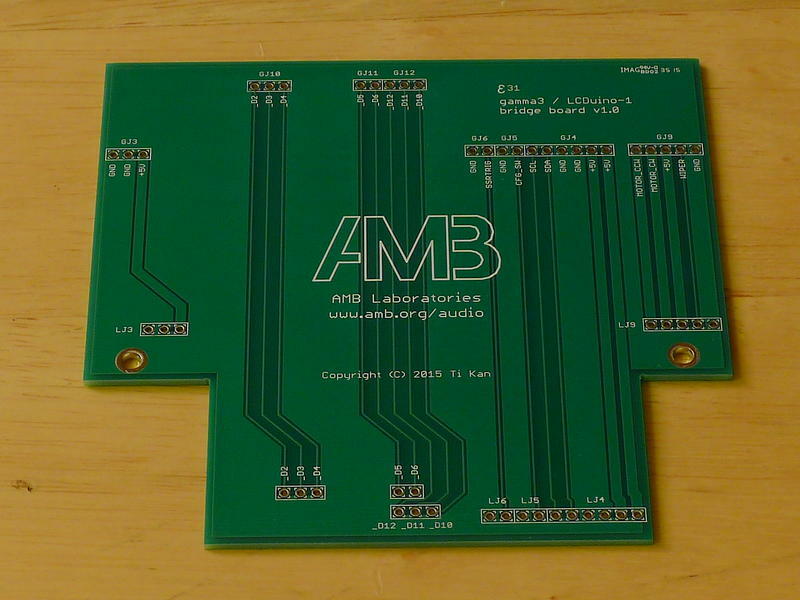 The ε31 bridge board has right-angle male pin headers to connect to the LCDuino-1, and female receptacles to connect to the γ3 backplane. 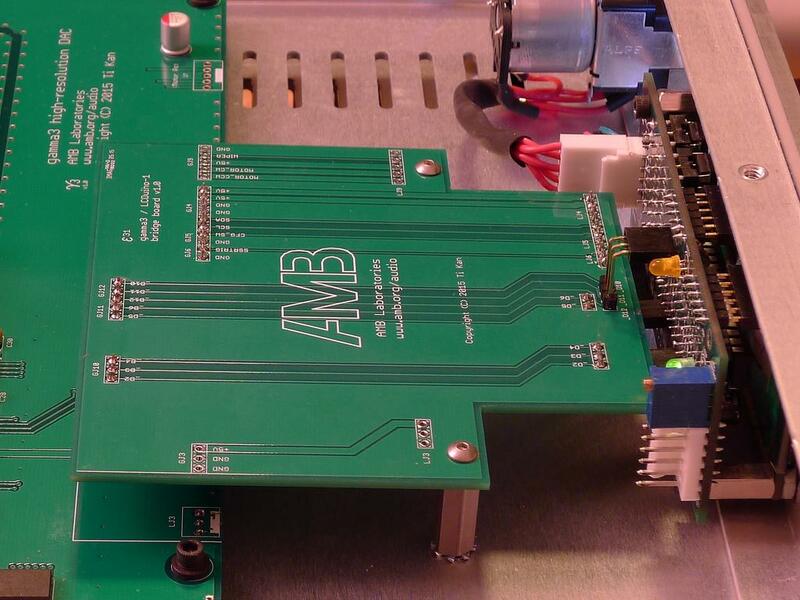 Instead of using Molex KK pin headers on the γ3 backplane for LJ4-LJ6 and LJ10-LJ12, use regular pin headers (with 0.318"/8.1mm mating length). The LCDuino-1's J4-J6, _D2-_D6, and _D10-_D12 connectors should be replaced with female pin receptacles. I will make a BOM for all this as soon as I could get it together. It should be very simple. I will make a very small run of these boards (10 pieces). I will use one and offer the remainder for sale. PM me if you are interested in one. 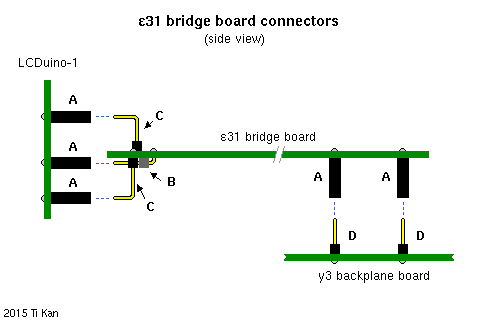 Here is an illustration of the ε31 bridge board and how it connects to the LCDuino-1 and γ3. All connectors are single row with 0.1" (2.54mm) pitch. C: Long vertical pin headers with 18.47mm mating length, manually bent 90° at an appropriate location. We have to do this because there are no pre-formed right angle headers with such long pins. All parts except "C" are available from Digi-Key and Mouser. I will supply the "C" long headers, as well as the 3P and 5P "A" receptacles. Please do not substitute the pin headers with others having different mating lengths. 1: LJ3, GJ3, LJ9 and GJ9 are not used. 2. All items marked "nnP break apart" has nn circuits on one piece. You can order one or two pieces for all positions that use the same type of connector. 3. Bend the pins 90° as shown in the illustration above. You may need to cut these pins slightly shorter. Update: Ten ε31 boards have been ordered. I installed one in my γ3. It fits beautifully, and everything works. You may need to maximize your browser window to see complete photos below. Those of you who expressed interest in the ε31 will get a message from me about how to order. I only have 4 pieces of ε31 available. If you want one but haven't yet PM'ed me, please do so ASAP. When they're gone, they're gone! Just FYI, the two metal standoffs used to secure the ε31 to the bottom of the chassis are #4-40 thread, female-female, 3/4" long, plus the thickness of a lock washer. 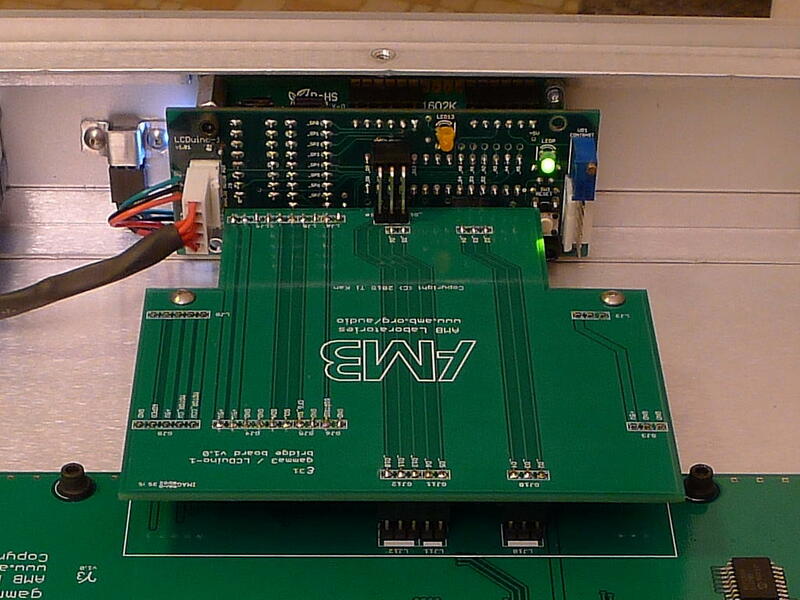 This makes a perfect fit with the locations and height of the LCDuino-1 and γ3 backplane boards. What do you have in J4, J5, and J6 on the LCDuino? Not sure I'm seeing it correctly. fierce_freak wrote: What do you have in J4, J5, and J6 on the LCDuino? Not sure I'm seeing it correctly. 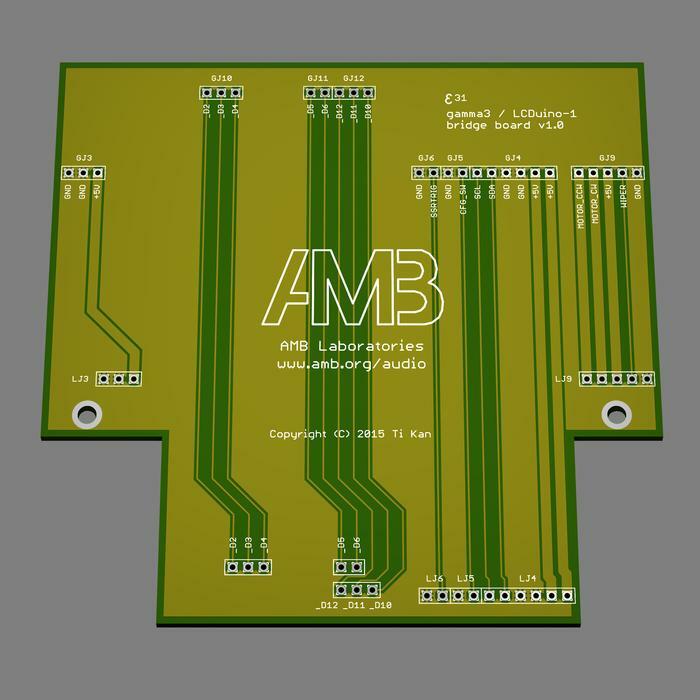 They are combined into a single 10P female pin receptacle on the LCDuino-1 side, to be mated to the ε31's matching 10P long pin header, which is bent 90 degrees and cut to the appropriate length (LJ4, LJ5 and LJ6). I knew that's what it must be, but my brain wasn't processing it correctly haha. I can see it now. Thanks for answering the dumb question. Hi Kan. What's the total depth of ε31 protruding from the board of γ3, and the depth of LCDuino-1 sticking out from the inner front panel? Basically the entire distance from the front of γ3 PCB to the front panel. I also need information on where to precisely drill holes for the ε31 relative to other components. I need to send a CAD file to a company that makes enclosures.